Jamille Matt's early header secured Blackpool's place in the FA Cup third round, but they were pushed all the way by National League North side Brackley in their 1-0 victory at Bloomfield Road. It took just six minutes for League Two Blackpool to assert their superiority, as Brad Potts' sweeping cross found Matt at the far post, and the striker nodded home from just three yards. The hosts came close to doubling the lead before the half hour through Potts, who was twice denied by Laurie Walker, saving low at his near post before pushing away a 20-yard strike. But Brackley, who knocked out Gillingham in round one, showed enough in the first half to trouble the hosts. Lee Ndlovu's 12-yard effort was deflected wide after 11 minutes and they were denied by the woodwork on the stroke of half-time as Clark Robertson nearly put past his own keeper. And they began the second half on top, as Ndlovu went through one-on-one with Sam Slocombe, but the Blackpool keeper saved with his legs. 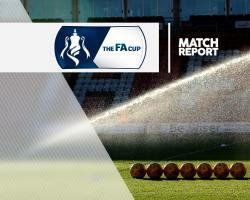 Brackley continued to threaten and in the 78th minute Glenn Walker's curling dead-ball was headed across goal - and Tom Aldred had to clear off the line to secure Blackpool's progression.